Notable solutions for impromptu investigations, meaningful meetings, & high-tech huddles. THE WHAT: The Revolabs FLX UC product family provides users with a series of standalone devices made to satisfy virtual meeting requirements in offices, huddle rooms, and medium- to large-size conference rooms. THE WHAT ELSE: To showcase the importance of high quality audio in meeting spaces, the company’s FLX UC 500, UC 1000, and UC 1500 conference phones feature powerful, high-fidelity audio capabilities that combine premium tweeter and mid-woofer elements, four integrated microphones, and audio technology such as acoustic echo cancellation, wide frequency response, and full duplex support. The result is incredibly clear-sounding calls in UC applications such as video and audio conferencing services, soft-phone calls, or webinars. Starting with the cost-effective FLX UC 500 USB speakerphone, users gain higher power than typical USB audio devices, which allows users to easily connect the unit to any PC, Mac, or Chromebook for use with communication applications such as Skype, Microsoft Lync, Vidyo, WebEx, and many others. Using the FLX UC 1000 and UC 1500 devices, callers can also participate in meeting environments featuring IP PBX systems, whether on premises or in the cloud—creating greater efficiencies for enterprises by letting users bridge calls. THE HOW: To facilitate IP calling capabilities, both the FLX UC 1000 and UC 1500 feature a convenient dialer with 3.5-inch color display while the UC 1500 provides the ability to add two directional extension microphones to augment intelligibility in larger spaces—resulting in the industry’s first all-in-one conferencing solution specifically designed for large meeting environments. THE WHAT: FSR’s popular HuddleVU collaboration suite has added features and capabilities developed to accommodate needs ranging from simple to complex, via integration with a new set of FSR switchers and even more furniture solutions including the new Mini-VU line of smaller collaboration tables. THE WHAT ELSE: HuddleVU collaboration systems deliver a solution that creates the ideal environment for several users to share and view their multiple inputs; laptops, tablets, and smart phones, on a single or multiple displays. When FSR’s new DV-MFMV-74 DV PRO, MultiVU, Seven Input Multi- Format Windowing Scaler is integrated with the HuddleVU FLEX System, it creates a 7-input/user system that has a windowing 4kx2K output with seamless switching and ease of integration with all HuddleVU Collaboration Furniture. THE BONUS: The HuddleVU’s switcher line is rounded out with the availability of collaboration solutions where only 2 inputs are needed. FSR’s new DV-HSW-21A 2 x 1 HDMI switcher and the DV-MFSW-21A is a HDMI + VGA & Audio to HDMI switcher integrate with one FSR T3 table box for small collaboration or huddle kiosk-type solutions. To compliment these new smaller offerings, FSR is proud to now offer the Mini-VU Small Group Collaboration Table for 2 to 4 users/inputs while the larger tables are built to accommodate 4, 5, 6, or 7 users/inputs. All tables are available in counter or table height and can be used with or without the vertical back panel for mounting displays. The Mini-VU is crafted furniture designed for collaboration, functionality, and form. If time is a concern, stock models are available, or a furniture finish from the Wilsonart Line of Quality laminates can be chosen for a custom table. THE WHAT: Epson is offering an All-in-One Collaborative Whiteboard designed exclusively for its BrightLink Pro-Series meeting room solutions that transform any flat surface into digital whiteboards and interactive spaces. THE WHAT ELSE: Designed to match the white color and sleek design of the BrightLink Pro, the new All-in-One Collaborative Whiteboard solution offers a premium look and all-in-one functionality by integrating a Da-Lite IDEA screen with 2.5 gain for superior image quality and wall mount, as well as the finger touch unit and control panel on the BrightLink Pro 1430Wi. Available in 87- and 100-inches, the new kit is easy to install—it hangs like a picture frame and image size is easy to adjust with preset heights—and the Da-Lite IDEA screen can also be used as a dryerase board. THE WHAT: With supported devices including Windows and OS X computers, as well as Apple and Android smartphones and tablets, Extron’s ShareLink 200 Wireless Collaboration Gateway provides simultaneous display of presentations, images, documents, and other content from up to four different personal devices, eliminating the need to change sources during a session. Content from a single device shows full screen, and content from multiple devices appears simultaneously in four windows on the display. Any user can share content and control the presentation when it is set to collaboration mode. A moderator mode ensures only approved content is displayed. THE WHAT ELSE: Designed for professional AV applications, this wireless gateway also includes many integrator-friendly features such as an integrated wireless access point, Power over Ethernet (PoE), and antennas mounted on the front panel. The ShareLink 200 Wireless Collaboration Gateway can be used to create a standalone wireless collaboration and presentation system or to add wireless presentation capabilities to a variety of wired AV system designs. THE WHAT: The VIA Connect PRO allows people to “Meet Smarter” through connection, collaboration, and engagement by providing them with a shared workspace that makes team collaboration in real time seamless and simple. THE WHAT ELSE: The VIA Connect PRO allows users in a huddle room to share files, chat with other attendees and collaborate together on a shared document using the whiteboard feature from their own devices. It also supports full iOS mirroring which allows users to show content from their iOS devices directly on to the main display. The VIA Connect PRO offers plug and play DCHP support and it will also dynamically tile up to four users screens on a single main display. Meeting participants can easily “step− in” and become the primary presenter on the main display. List price on the VIA Connect Pro: $995.00. THE WHAT: AMX, a HARMAN Professional brand, is offering Massio, its newest ControlPad Series that melds the installation flexibility and affordability of wall/lectern mount keypads with the device and room control capabilities of a central controller. The result is an ideal control interface for classrooms, conference rooms, or any room where simple device and environment control is needed in an equally powerful yet easy to manage user interface. THE WHAT ELSE: The AMX Rapid Project Maker (RPM)-configured Massio ControlPads are available in 6-button and 8-button configurations that each feature a built-in AMX Controller to give users unrivaled power to control and automate room AV, lighting, HVAC or practically any device or system you’d like to manage. Both models are also extremely easy to navigate, utilizing LED-backlit pushbuttons that glow blue to indicate activity. Massio 8-Button ControlPads also include a rotary control knob with backlit level indicators to enable quick rotary adjustments of volume, lighting, or other control aspects. THE BONUS: Integrated PoE connectivity simplifies installation, eliminates the need for a separate power cable and makes Massio connected devices instantly manageable. THE WHAT: Audio Video Furniture, formerly known as Video Furniture International, offers a diverse portfolio of huddle room and collaboration tables, including the T324 T3. The solution brings a high-tech look to small collaboration rooms. It is also offered as a room package: T324 T1 (tower) and T324 T3 (credenza). THE WHAT: Altinex has expanded its ShareTime collaboration product line to include the ShareTime HDMI Cable (CB300-101), the ShareTime 4x1 HDMI switcher (UT260-041), and the ShareTime Collaboration Package (UT100-041). The Altinex ShareTime Collaboration product line is designed for small group collaboration environments, including conference rooms, libraries, schools, and huddle rooms. THE WHAT ELSE: The Altinex ShareTime HDMI Cable (CB300-101) is an HDMI display controller that enables cooperative display control using a ShareTime controller and cable in a single assembly. Multiple CB300-101 HDMI cables enable several users to connect to a single display and work together as they seamlessly switch between sources. ShareTime works with existing or new installations. The HDMI cable is flat, measures 10 feet in length, and contains a built-in amplifier to maintain HDMI signal integrity. Any number of ShareTime units can be used together to form a collaboration environment with a single multi-input video display. The Altinex ShareTime undertable 4x1 HDMI switcher (UT260-041) is a four-input, single-output switcher with HDCP (High Bandwidth Digital Content Protection) repeater functions along with fast-switching between HDMI input ports. THE BONUS: The ShareTime Collaboration Package (UT100-041) is a collaboration system that includes four CB300-101 HDMI ShareTime Cables and one UT260-041 HDMI 4x1 switcher. The system offers full HDMI and HDCP compliance, provides CEC enabled control, and automatically powers the display on and off when used with CEC compliant video display monitors. HOW MUCH: List Prices—ShareTime Collaborative Cable (CB300-101): $95; ShareTime 4 x 1 HDMI switcher (UT260-041): $225; ShareTime Collaboration Package (UT100-041): $630. THE WHAT: InFocus embraces BYOD with LightCast-enabled collaboration solutions, including new JTouch interactive display. LightCast technology enables BYOD connectivity and all-in-one digital whiteboarding and Internet browsing. The company is also launching its first device with the new technology built in, the interactive touchscreen JTouch with LightCast (INF6501c). THE WHAT ELSE: InFocus’ LightCast technology allows people to wirelessly cast content from their Windows, Apple OSX and iOS, and Android devices to a display screen or projector. LightCast devices also offer whiteboard tools, which let users draw, highlight, annotate and capture notes that they can share with anyone via email. Rounding out LightCast’s functionality is a Web browser to enable Internet access without being connected to a separate device. THE WHY: “People don’t keep their meeting content only on their laptops anymore, but also have images, data and PowerPoint presentations on their tablets and phones. InFocus’ LightCast technology lets them not only share what’s on their smartphone or tablet with everyone, but also offers them other tools to make their meetings run more efficiently, such as a digital whiteboard and quick access to the Web,” said InFocus product manager, Robert Detwiler. THE WHAT: Vaddio, a camera and camera control manufacturer dedicated to “The Art of Easy,” developed a line of products to enable users to connect and present within a huddle room, but also to add capabilities for videoconferencing through cloud-based services. Vaddio was one of the first manufacturers to focus on huddle space technology in a dedicated way. THE WHAT ELSE: By connecting via HDMI or VGA, the room’s monitor connects to Vaddio’s control dock located on the meeting table. Users connect personal devices to the BaseSTATION and begin using their favorite collaboration tools instantly. It allows any application to be shared or collaborated in the meeting room. 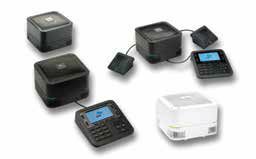 Users can also use the standalone SIP based speakerphone for audio conferencing calls. WHAT’S INCLUDED? The BaseSTATION includes the necessary peripherals to create a multiuse room and group collaboration experience: an HD point-of-view camera, mics, and a control dock. THE WHAT: One of Vaddio’s core huddle suites is the HuddleSTATION (available in a Deluxe or Basic offering). The Basic version includes a Mic-Dock, Cam-Bar and 25’ Shielded Cat-6 SSTP Link Cable. The Deluxe offers all of those key features, as well as an included Wall Mount. THE WHAT ELSE: The solution’s integrated sound bar includes a camera, a pair of two-way pro audio acoustically tuned loudspeakers, professional integrated WideSHOT camera and auto-focus and Vaddio’s quick-set manual pan-tilt camera adjustment system. Mic-Dock features: Four cardioid mic elements each with its own independent DSP featuring AEC, automatic noise reduction and AGC, 360-degree pickup pattern with 12 foot pickup range, VoIP speakerphone with integrated dial pad, integrated touch screen remote for zoom, PIP, and two-input source selection and PC/Tablet Docking function with USB, HDMI, VGA and Ethernet. THE WHAT: Using Crestron’s AirMedia, you can walk into any meeting space and wirelessly present PowerPoint, Excel, and Word documents, PDFs, photos, and screen shots from your personal iOS or Android mobile device on the room display. Mac and Windows notebooks also connect seamlessly, making presentations and collaboration from almost any device incredibly fast and easy. Up to 32 people can connect to AirMedia at the same time in the same room. Each person pushes the “show me” button to display content from his or her device. In Quad View mode, up to four presenters’ content can be displayed simultaneously, making true collaboration possible. In moderator mode, presenters and instructors can easily control the room and prevent “presentation chaos.” Just select whose content to share and whose content to not share, all from the AirMedia web page or Crestron touch screen. THE WHAT ELSE: For large meeting spaces where the display can be difficult to see, Remote View enables up to 40 participants either at the back of the room or in other locations to log in from a web browser to view the presentation on their mobile devices. AirMedia seamlessly integrates with Crestron DigitalMedia so you can share your presentations. With built-in network connectivity, it can communicate with Crestron control and Crestron Fusion software. AirMedia can be managed and monitored with Crestron Fusion and Simple Network Management Protocol (SNMP). This is especially valuable when AirMedia is used as a stand-alone device, i.e. without a Crestron control system.